Before I begin I want to insert a couple personal comments. This week Jane over at Chilly Hollow’s blog (http://chillyhollownp.blogspot.com/) wrote about my blog. What an honor that was, Thank you Jane. I noticed an increase of traffic to my blog but did not realize what was happening until I read Jane’s blog later in the morning. Needless to say, had I more visits to my blog than ever. Thank you Jane. AND Thank you to all of you who took a few moments to visit and read my blog, I hope you will return. I did not know this but I’m sure Deborah is correct and Toppy picked his name…he just has that look about him. His suit is Velvet, so soft but requires a wee bit o’ patience to stitch. Very Velvet threads need to be cut short, really no longer than 12-15 inches…a good quick measuring tool is from fingers to elbow. Use a larger sized needle, this will help open up the holes of the canvas and allow the thread to pass more quickly with less friction. 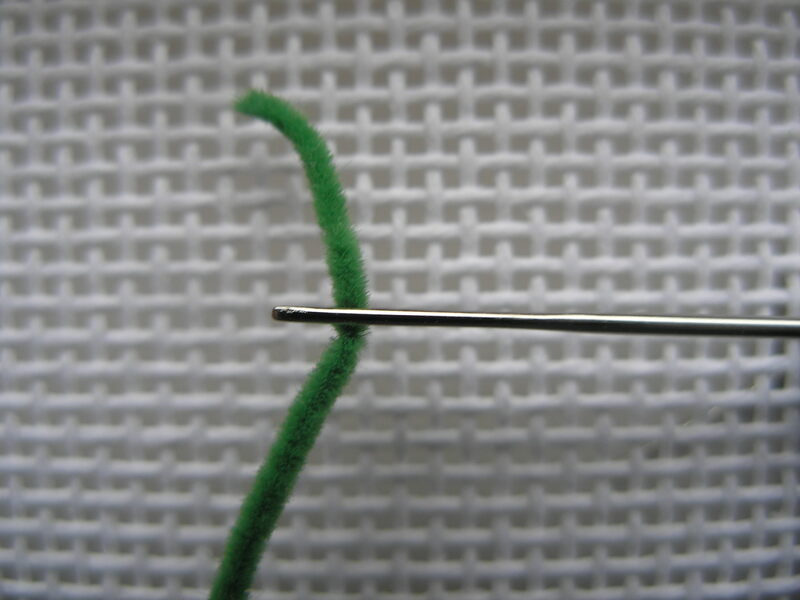 Place the needle a ½ inch onto the thread and DO NOT move around in the needle. 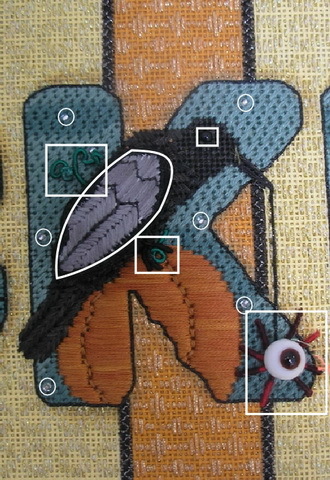 The pictures on the right show how thread will wear. 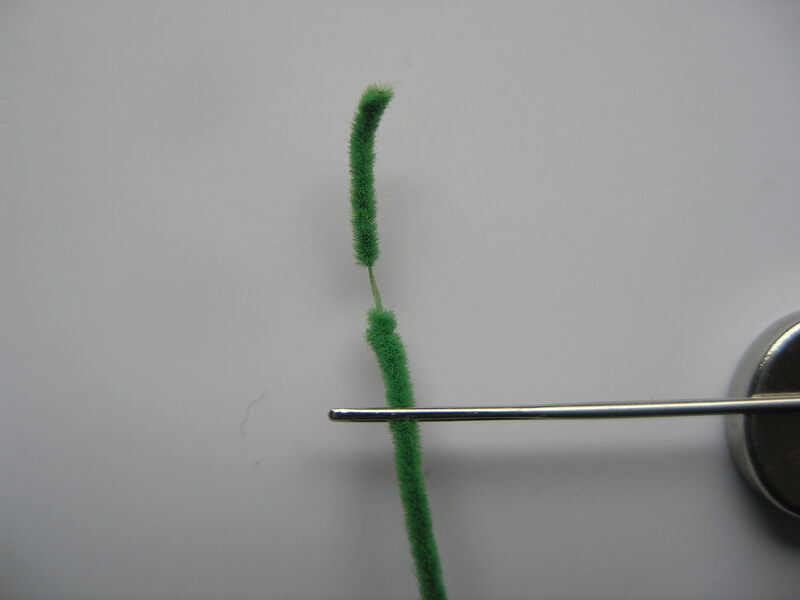 Sometimes the thread will break and then the needle needs to be moved in another ½ inch. Toppy’s jacket is stitched in Mosaic stitch. Notice the letters on my jacket (A-B-C-D). 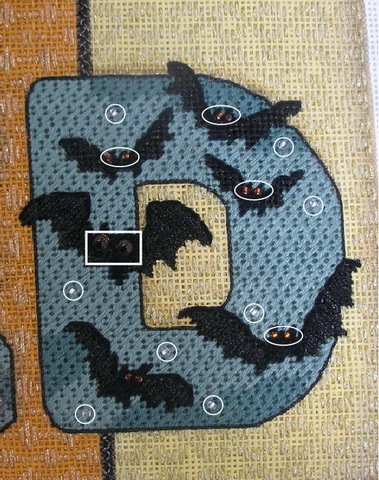 This was the order my jacket was stitched in case one card of Very Velvet did not allow my entire jacket to be stitched. 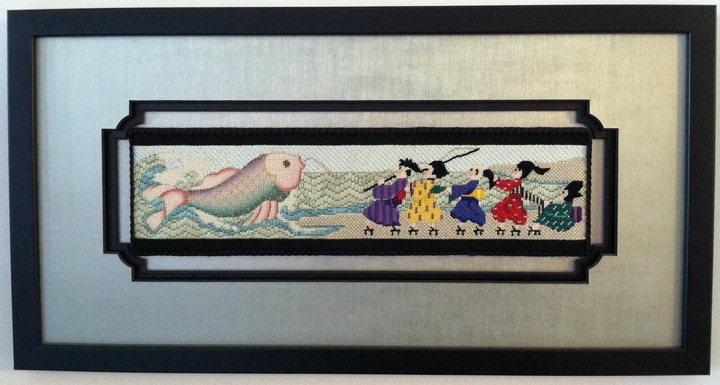 There did not appear to be a change in dye lots but sometimes these subtle variations do not show up until after stitching is completed. Should a new card have been needed it would have been used in ALL of area D.
There is a psychological reason for this…we read words from left to right and we also usually scan pictures from left to right. If the thread needed to be changed and there had been a slight variance in the dye lot it probably would have be skimmed across and areas C & A would have been the last the eye would have scanned and since they are identical the mind would have dismissed the first B-D variance. 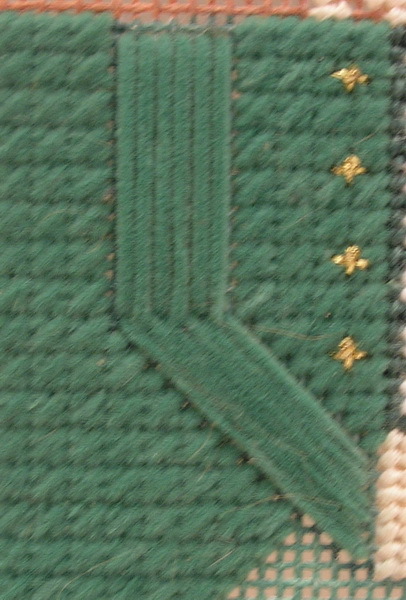 The sleeves are padded Horizontal Gobelins. The padding of the sleeves was done with the Very Velvet but #5 perle coton could have been used for the padding to conserve thread usage. See how the sleeves stand up off the jacket? The pants are also Very Velvet but a darker green and they are stitch in Diagonal Gobelin. 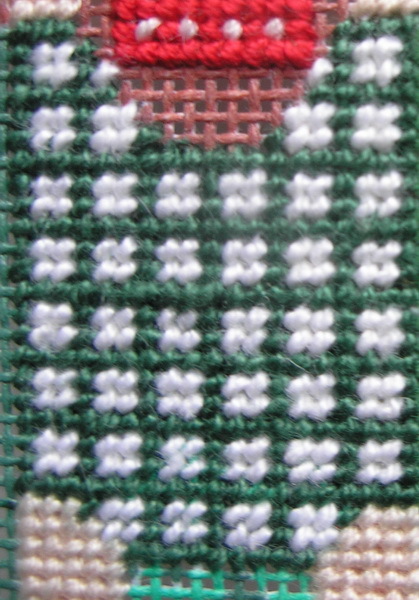 You would also stitch these in a special order if using 2 cards of threads. 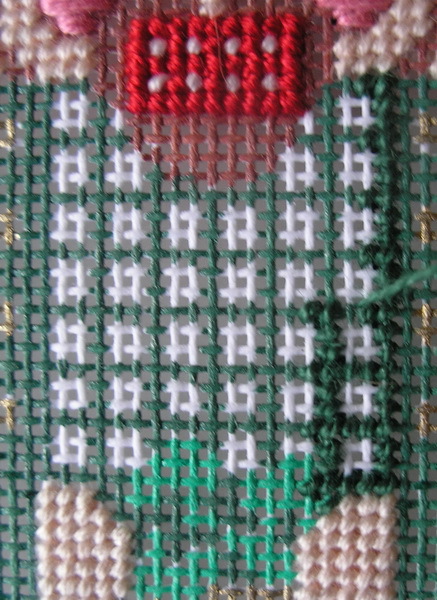 In this case the two outside areas would be stitched first because when finished they well be adjacent to each other. 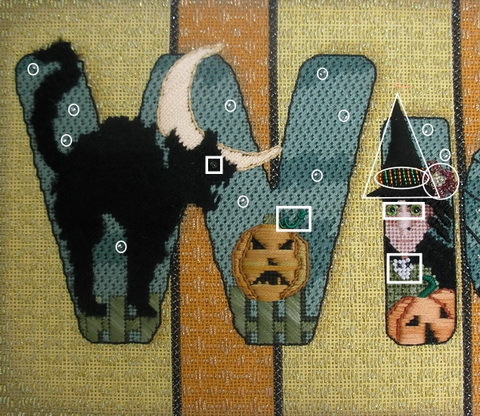 The two inside areas are separated by other stitches and will show less change. 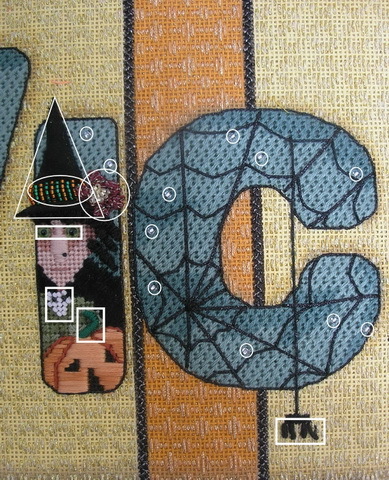 The ideal thing is to not to run out of thread or to have to use threads from two separate cards. 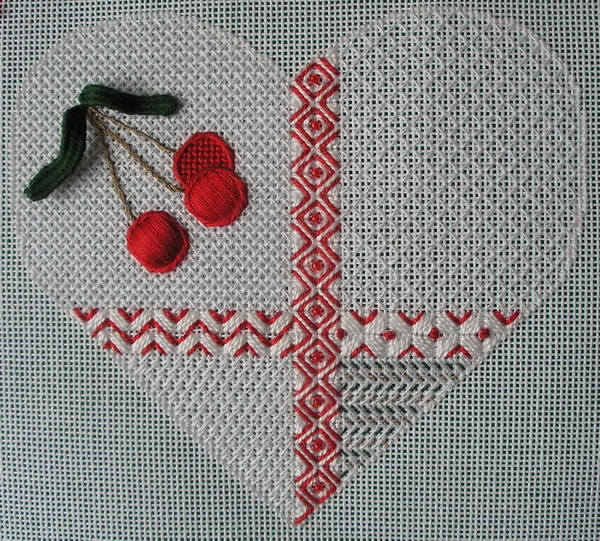 Buy enough thread to stitch a piece at the same time! 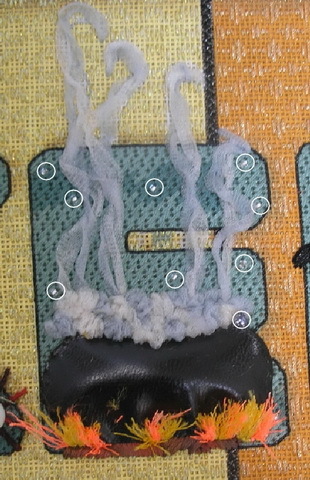 AND this WILL NOT work for obvious dye lot changes in threads. 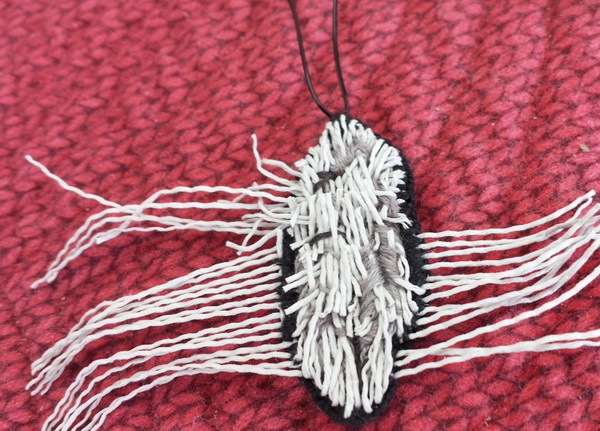 But occasionally it will happen that you have to use more than one card of a thread and if you cannot use either a needle blending or stitch technique to blend these threads together this is another way to minimize the subtle changes that might occur. This only works IF the dye lot change is hardly noticeable or if you are unsure that the cards were purchased at the same time. 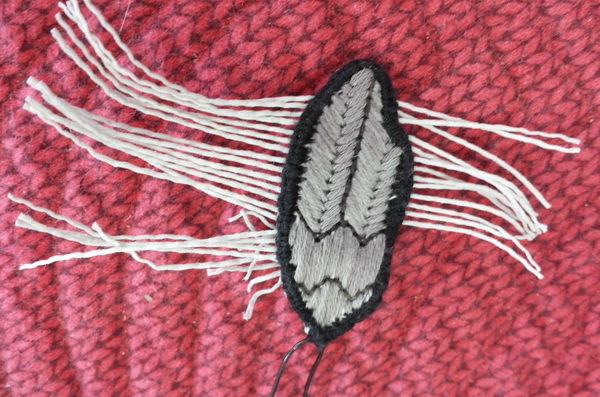 Remember not to place two different cards of threads adjacent to each other or where they will touch when finished. Also try to place in the most inconspicuous areas. 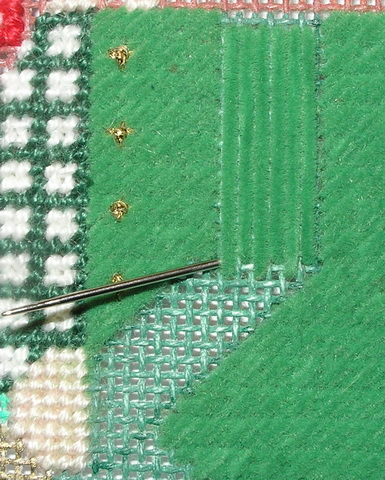 Toppy’s sleeves would have been the best area to change threads since the stitch also changes and “the mind” would have probably attributed this small color change to light play on the stitches. So now Toppy has duds and is feel’n mighty proud…next socks, shoes and a hat, then he’ll get some hair too.